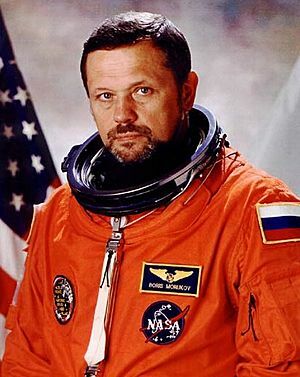 Boris Vladimirovich Morukov (Russian: Борис Владимирович Моруков; 1 October 1950 – 1 January 2015) was a Russian physician and cosmonaut. He was best known for flying aboard NASA Space Shuttle mission STS-106 as a mission specialist. He also trained with the Russian Federal Space Agency as a research-cosmonaut. Morukov was born in Moscow. In 1973, he got his M.D. from the Russian State Medical University. He was married to Nina and had two children: a son, Ivan, and a daughter, Olga. Morukov died on 1 January 2015, aged 64. Boris Morukov Facts for Kids. Kiddle Encyclopedia.